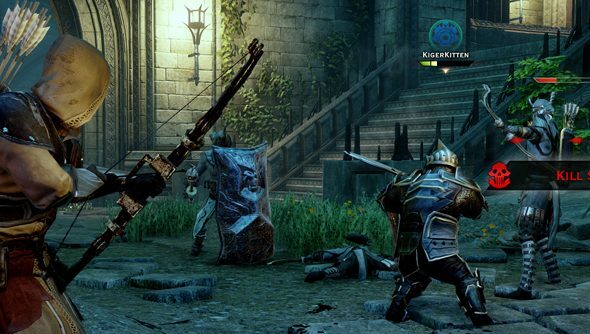 The very first BioWare games had multiplayer. S’true: both Baldur’s Gate games had slightly slapdash, direct-connect co-op – and Neverwinter Nights was designed for modular D&D adventures with small parties of friends. The newly-announced Shadow Realms is an explicit attempt to recapture that tabletop vibe, and it looks like something similar is going on over in Dragon Age: Inquisition. The sprawling RPG sequel will have a separate multiplayer mode, designed for 20-30 minute bouts of dungeon-looting. Three multiplayer ‘campaigns’ will launch with Inquisition on November 21 (November 18 for America). Each comprises a large level, assembled from five smaller, pre-designed areas. The areas in each campaign are picked from a set of 10, are shuffled about at random – so you’ve no chance of knowing what’s behind every door. The mode will cast four players as agents for the Inquisition, and take in Elven Ruins, an Orlesian palace, and a cross-section of infamous magocracy Tevinter. But there’ll be no dialogue trees here: only Dragon Age’s squad-based combat, and lots of loot. Finish a multiplayer quest, and you’ll bring back gold to spend on treasure chests: booster packs filled with new equipment, potions, grenades, salves and item recipes, as well as the occasional unlocked hero or skin. Unwanted items can be broken down into bits, and reassembled as new sets of armour or upgrades for weapons. There’s a Hearthstone-esque crafting metagame at work here. There’ll be no crossover with characters in single player. Instead, BioWare Edmonton will provide nine multiplayer heroes at launch – three mages, three melee specialists and three archers. Each is an individually-levelled character waiting to be steered to your tastes. New levels and hero types will be added for free after release – and weekly objectives will reward players for logging in regularly. Global Operations see the whole community work towards a shared goal, while Prestige objectives find players rewarded with cosmetics for personal accomplishments. It’s generous, but not philanthropic: BioWare will make a little on the side from time-saving microtransactions. Nothing will be paywalled, however. Clearly this is not Dragon Age: Inquisition’s main event, but Mass Effect 3’s multiplayer component didn’t do it any harm at all. Do you think you could stand to forgo the plot and the pause button for a bit to play with friends?